Sony and SEGA of Japan are releasing 2 PS4 x Yakuza Kiwami special limited edition console models on January 21st in Japan to celebrate the Yakuza Kiwami (a remake on the original 1st Yakuza title) launch on the PS3 and PS4 on the same date. However, not everyone can buy this very limited edition of the PS4 console because it will be only sold in 3 Sony Stores in Japan: Sony Store Ginza, Sony Store Nagoya, and Sony Store Osaka. The console’s price will be 36,980 yen (excluding tax) and will be available in white and black. Both, the game and the console, are part of the Yakuza 10th Anniversary celebration. 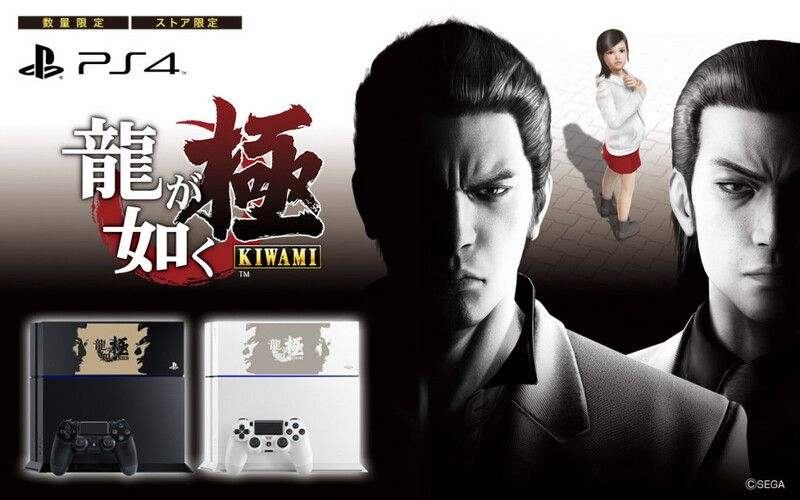 “PlayStation 4 Yakuza Kiwami Edition”, the PS4 console lid has Kazuma Kiryu aka the “Dragon of Dojima” and his best friend and rival Akira Nishkiyama engraved. The PS4 Yakuza Kiwami Edition will be produced in very limited quantities. In addition SEGA and Famitsu are releasing a Yakuza 10th Anniversary book that same date in Japan.